Made In USA. SIMPLE time and attendance system for 50 employees using network connection and contact-less RFID cards. Read more, below. Inexpensive, reliable, simple to set up, easy to operate. User-friendly operation - just waive the badge in front of the clock, and go. Connects via your network back to one computer, password protected program. Uses Windows based software, runs across your network back to your PC. Includes many common payroll exports (import to QuickBooks, ADP, Paychex). Print time cards, save them to your computer, save all records, forever. Run reports by week, bi-weekly, semi-monthly, monthly, and so-on. Regular, 1.5, 2.0, special Saturday or Sunday, or 7th day OT. Set up up to two different pay cycles within the same system (this is unique). This system synchronizes with your PC, so it's always correct. Adjusts for leap year, daylight savings (or turn it off). Pays to the minute, or nearest 15 ("1/4 hour rounding"). 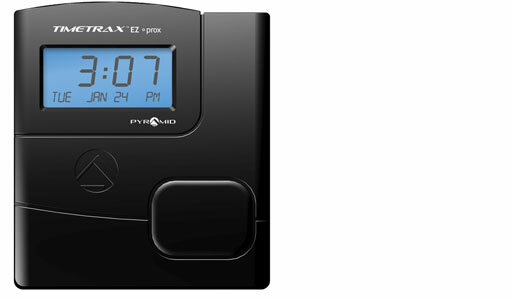 Can be connected by cable to a Pyramid Wireless Master Clock System. Unlimited IN and OUT punches per employee, per week (one punch per minute). Add more terminals as needed - front entrance, break room, building #2, etc. Punch IN on one, OUT on another, IN, OUT, and so-on. This is a Windows product. Windows XP, Vista, Win 7, Win 8. Runs on one PC only, across your network back to your PC. Made In U.S.A. Software written and supported in U.S.A.